IT IS NE ARLY 7 P.M., and the baby wants her meat. Tonight on the menu it’s late-summer peach pie two ways: one with an all-butter crust, the other half lard. At the kitchen counter, I’m knuckle-deep in grated lard; warmth from the nearby oven infuses the air with a porky aroma. The resident one-year-old, who prefers meat above all foods, sniffs the air and rattles the bars of the gate locking her out of the kitchen like a raptor kept from prey. My team of tasters, including the cage-rattling baby, will determine which combination makes the best dessert. Necessity (or impatience) demands that we sample it twice: warm from the oven that evening and cooled for the next morning’s breakfast. 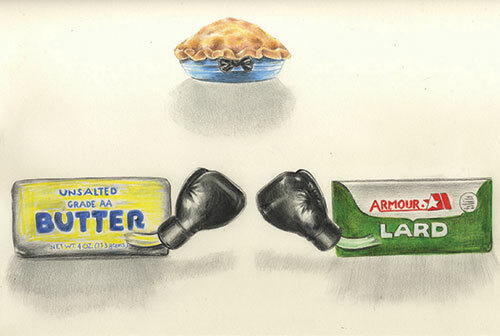 For pie lovers, crust defines the art, and opinions are divided on the best fat. Butter imparts rich flavor, while shortening or lard contributes flaky texture. The debate has continued for some time. Review the cooking section of your local used bookstore — or, these being modern times, browse the virtual aisles at Powell’s — and you’ll notice the heyday, death, and rebirth of lard in America through crust recipes. Books specializing in early American or regional cooking tend to recommend lard or a lard/butter blend. In Masters of American Cookery, M.F.K. Fisher and Betty Fussell cite lard as the traditional choice for American crusts, supplanted by shortening in the early 20th century when it was understood to kill you more slowly than animal fat. 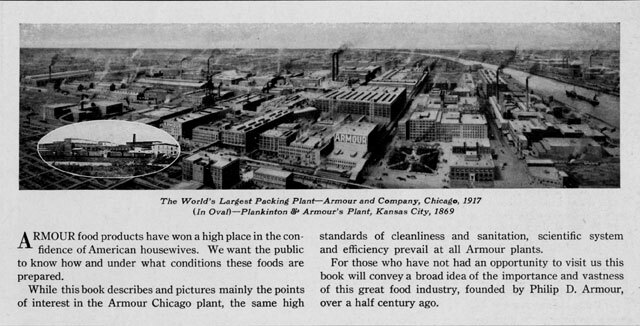 In 1912, Crisco touted its product’s ability to produce more uniform and “digestible” crusts than lard; an advertisement in American Cookery promised a more wholesome crust in part because Crisco “is always the same” (emphasis theirs). Housewives across America bought the concept, and the mid-century recipe books I consulted overwhelmingly recommended shortening crusts. Thy Tran, a chef and writer who produces the blog Wandering Spoon, learned how to bake butter/shortening crusts when she grew up in the Midwest, but became interested in lard as an adult. After the tide turned away from trans-fats, she eschewed shortening and concocted all-butter pies, but missed the flaky consistency that shortening provided. Many home cooks prefer butter, which is easily available and won’t be rejected by non-pork consumers; because of lard’s reputation, some believe butter a healthier choice as well. Among all-butter proponents count Chris Bauer, who delivers pies in Northern California through his Pie Truck business. For our tasting, I decide against producing an all-lard pie, which no one seems keen to recommend outside of dusty cookbooks on early New England cookery, and instead focus on whether a half-lard crust is superior enough for anyone to take note and will merit a trip to the butcher. I use a basic recipe of two cups of flour, a bit of sugar and salt, and 8 ounces of either butter or a half-and-half butter/leaf lard blend. In working with the raw dough, lard is easier to manipulate. One of the other tasters, an experienced baker, rolls out a circle of each and comments that the half-and-half crust rolls more smoothly, with less fraying at the edges. Forty minutes later and the pies are out of the oven. The tasting panel — four members of my family, including the baby — find the warm slices difficult to distinguish and are split over which is preferred. They know they’re tasting one half-lard crust but don’t know which is which, and it’s interesting to see how expectations color the commentary. A taster from Madrid, who hasn’t eaten much lard in her food, says that one crust tastes fatty. “I like the all butter,” she says, and points to her preferred crust, which is lard. In the morning, when the pies are served along with milky coffee, the benefits of each are more apparent. Panelists agree that the butter crust is soggier, especially the bottom crust. The expert baker notes the half-lard crust “holds up better” and “maintains shape.” One taster reports that the peach flavor sings against the lard/butter background but seems muffled against the rich butter crust. Each of the adults prefers the half-lard crust. For pie lovers, crust defines the art, and opinions are divided on the best fat. The baby, who retired after dinner and missed out on the late-night judging, is the first awake for the morning tasting. As we assemble around the table, she fists butter crust into her mouth, chews, and looks pensive. Enjoyable enough, it seems — nothing is spit onto the molded plastic table. Next she eats a soft slice of peach, then tries a bite of lard crust. She sits back in her chair — and then she claps. No one can believe it. A fellow taster delivers another piece of lard crust. Again she claps, more loudly this time, a resounding approval generally reserved only for the robotic rabbit that dances when you squeeze its paw. From the mouths of babes: Lard rules. COLLEEN HUBBARD is a full-time writer and part-time cheesemonger. She writes the Segment and the Line, a Web site about food and books. ELIZABETH ZECHEL is the author and illustrator of the children’s book Is There a Mouse in the Baby’s Room? and illustrator of The Little General and the Giant Snowflake, by Matthea Harvey. She lives and works in Brooklyn. THE APPROPRIATE WAY TO KILL AN ANIMAL IS to first bind its limbs, and second, pull the heart out of its chest. So says the Yassa, the code of law devised by Genghis Kahn. The appropriate way to kill a mouse for a taxidermy project is to use CO2, according to a lively forum on the Web site taxidermy.com (“It is very cheap. You can shake up a can of Coke, crack it, let the CO2 into a bag, pop a mouse into the bag, seal it back up, and Voila: Refreshments and mice to skin.”). The American Veterinary Society has an impressively comprehensive list of appropriate ways to kill animals ranging from zoo animals to hamsters, delivered in such detail that they seem to find it necessary to preface the document with a disclaimer that the information inside should not be used to kill humans. The appropriate way to kill a pig is via an electrical stunner or a captive bolt gun. Carbon dioxide is only appropriate for breeds that don’t have a reputation for being “nervous.” (Pigs bred for lower fat content tend to be high-strung.) More critical than tools are people: A slaughterhouse should be managed by a person who sincerely cares about his or her job — otherwise the stunner and the gun won’t be well maintained, the slaughterhouse won’t be kept in good working order, and the kill floor workers will inevitably care less and less about doing their job well. So says Temple Grandin, the American authority on all things slaughter. Of all the figureheads in the pantheon of contemporary American food culture, Temple Grandin has had one of the oddest trajectories to fame. Fifteen years ago she was a respected slaughterhouse consultant, which is another way to say that hardly anyone knew about her unless they had a kill floor that needed improving. Then Oliver Sacks, the neurologist and New Yorker writer, wrote an essay about her. 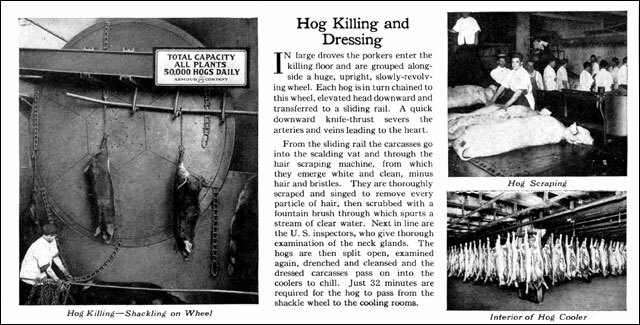 Grandin was the kind of character that was stranger than fiction — an autistic woman who claimed that autism gave her a particular insight into animal behavior, who openly wished that the human race had never evolved to eat animals, but who, out of pragmatism, chose to use her understanding of animals to help slaughterhouses kill them more quickly and effectively. Of all the figureheads in the pantheon of contemporary American food culture, Temple Grandin has had one of the oddest trajectories to fame. The conviction that one has special insight into what animals are thinking is not a particularly autistic trait. This world is full of people who are convinced that they know what their cat is thinking. Autism researcher Simon Baron-Cohen believes that Grandin’s expertise is too often viewed as a quirky, Rain Man–like talent rather than the product of a lifetime of research. But the story that Sacks spun around Grandin, and the intense cultural fascination with autism that began in the mid-’90s, made her into a totemic figure — an oracle who, by virtue of her understanding of animals, and pragmatism regarding humanity’s treatment of them, seemed to provide a certain absolution. And now Grandin is also a name on a meat label. It’s a nice meat label, as meat labels go. It shows a cow and a pig and a sheep all nestled together. An old-timey windmill squats daintily in the background. “Certified by Dr. Temple Grandin,” it reads. “Sustainable and Humane.” An accompanying press release states that the company’s slaughter standards were developed by Niman Ranch and Grandin. It also points out that while meat labels with buzzwords like “fair trade” or “animal welfare” or “shade-grown” are common in the food industry, a label with a single person’s name on it is very unusual. It’s a bit peculiar that the label was co-developed by the name-challenged Niman Ranch — a once-pioneering meat company that retains the name of its founder but not the actual person. Bill Niman once sold to Chez Panisse, and spearheaded the marketing of hormone- and antibiotic-free meat. Now Bill Niman raises and sells livestock under the name BN Ranch. He’s not allowed to sell meat under his full name — when he left the company in 2007, his name stayed behind. In recent years, Bill Niman has called out Niman Ranch for doing things contrary to the company’s original mandate. Cattle are now raised in commercial feedlots. 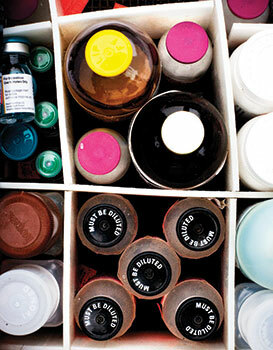 Antibiotics are still not fed to healthy livestock, but antimicrobials (which fall outside of the USDA’s description of antibiotics) are. The ranch named after Niman responds with the argument that (a) all of the above are widely practiced and (b) the company is making money, a different state of affairs from when both Bill Niman and his name were on the premises. 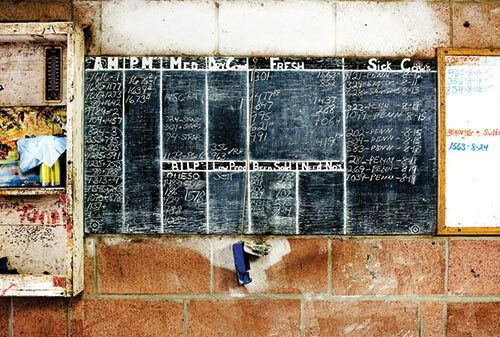 Not much has changed except for the addition of Grandin’s name, says Paul Willis, head of Niman Ranch’s pig division. When asked about Niman and the accusation of standards compromise, Willis mentions, quite graciously, that Iowa ranks 50th in the nation in terms of water quality because of industrial hog farms with far looser standards than Niman’s, and that he could see two of them from where he was standing. Everyone is trying to come up with the right way to kill an animal, and then eat it, and still make money at it. And now Niman Ranch also has Grandin’s name. Or rather: sort of. A few days after Niman Ranch issued a press release announcing its collaboration with Grandin, she issued a clarification. She was not approving of the standards themselves, she wrote. She went on to describe many of Niman Ranch’s standards (no antibiotics for healthy animals, no keeping animals without access to pasture) as “niche” standards. Grandin was, she said, approving not of the code, but merely of the clarity with which it was written. It was a statement mystifying in its narrowness. Surely Grandin, the anthropologist, after years of studying us, the Martians, would realize that we would see a label like “Certified: Sustainable and Humane” and think of pigs gamboling in a pasture, rather than standards approved for legal clarity, rather than ethical content. There are so many codes for the right and wrong way of doing things — and so many of them dependent on the name of the person associated with the code. Bill Niman is trying to police the use of his former code from afar. Niman Ranch needs a new name to attach to its code, because the old name is out there making trouble. Everyone is trying to come up with the right way to kill an animal, and then eat it, and still make money at it. A friend of mine stopped eating meat when she returned from living in the countryside because she couldn’t imagine eating meat again that wasn’t purchased from someone who was fully known to her community. In urban areas, people like Grandin and Niman have become semaphore for that knowledge. Is there a code that can replace the trust that we place upon individual people, sometimes heedlessly? 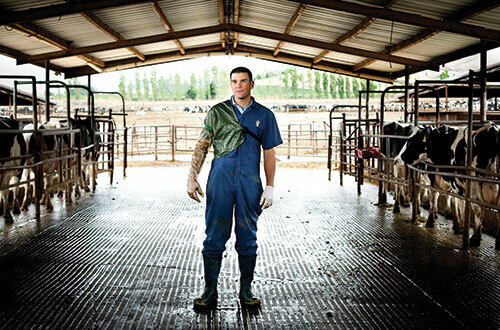 GRANT MILLER IS A LARGE-ANIMAL VETERINARIAN in Petaluma, California. Meatpaper spoke with him about caring for the animals that feed us. He treats livestock on both traditional and boutique ranches to maintain health in a ranching system that is making room for organics, a younger generation, and an interest in eastern medicine. I remember a friend telling me when I was 13, “If you don’t become a vet, you’re going to miss your calling,” and that stuck with me. I really respect the people I work for because they are providing the nation’s food supply and that’s a big, big job. I’m just proud to be helping them out. I’m lucky. Are there any peculiarities to practicing in California? We have diseases here in California that are not in any other parts of the country. But the same can be said for other parts. For instance, the Potomac Horse Fever (1) exists largely on the East Coast but is not very prevalent here. We have things like Epizootic Bovine Abortion (2) and Pigeon Fever. (3) California is known for having a very, very difficult state board exam. A lot of people are deterred from practicing here because they don’t want to take the exam here or they can’t pass it. What happens when there is a viral outbreak? The State Veterinarian’s Office at the capital comes in and takes over. When it comes to infectious disease like avian flu — there was an outbreak of that a few years ago in Los Angeles — they usually will come in and take over because it’s so much effort to find every animal. Once in a while we get a tuberculosis flare-up in cattle. We are dealing with one right now. We spend a considerable amount of our time doing vaccinations. With the economy the way it is, more owners are doing their own vaccinations, which is fine to do, as most vaccines are over the counter. My role on these ranches is really to formulate health plans for the animals. For example: This is when I am going to do my vaccinations, this is when I am going to de-worm, this is when I am putting my rams or bucks in with the females, here is when I am going to give mineral supplements. We create an overall management plan for the year because my role is largely to prevent problems. On any given day, I could be dehorning a goat, doing a hoof abscess on a horse, and then a pregnancy check on a cow. I do lameness work to dental work to emergencies. I can pretty much see it all in a day, and I have, believe me. Are pregnancy checks done with sonograms? Not on cattle; we just palpate. (4) On sheep and goats I’ve done ultrasounds. Is it ever emotionally confusing to work with animals that are considered commodities? A lot of my sheep and goat people have what we call boutique herds or flocks, so they’re really pets. I definitely respect the fact that a lot of the ranchers have to be careful about their options, so they do what they can do within their means. It’s not that they don’t care for the animals. Horses are no different. It’s just that one animal owner might have more means to care for one horse than another has to care for one sheep in a flock of 1,000. You have to get creative with how you’re going to treat a lot of animals. There are those animals that may have a chance, they just need a couple of hundred more dollars into them and they don’t have it. It’s sad when that happens, but I think it’s the reality of the business. You have to respect that line. Do ranchers usually trust your opinion? When I save an animal, they start to trust my opinion on things. I think most of them know that I’m looking out for their best interest as well as the animals. And I definitely hear when they tell, “Money’s really tight right now.” Or I hear them when they say, “Let’s do everything we can do to save this animal.” It’s really just about fostering relationships with people and getting to know them, getting to know their priorities and their beliefs and learning to abide by them. There can be stark, stark differences. There can be people that are really coming from left field, in my opinion. For instance, there are people who don’t believe in the use of western medicine whatsoever. They only use eastern medicine. Not that herbs and acupuncture don’t work, but I think there are appropriate modalities for every situation, and sometimes a western approach might be better than an eastern approach, and I let them complement one another. A lot of times, people view it more like a religion and they don’t “believe” in penicillin, which is ridiculous to me. But since that’s their core belief system, you have to do what’s best for the animal within that realm. You have to really stretch your knowledge. Yep, I’m a certified acupuncturist, and I do use acupuncture daily. You can use it for everything from a fever to hives to arthritis. You can have a cow that’s down and you do some acupuncture on that animal to help get it up. Sometimes for reproductively challenged animals you can use acupuncture to help them get pregnant. I can’t imagine an animal sitting still for it. They like it. A lot. They relax. What other types of eastern medicine treatments do you use? Eastern medicine is largely acupuncture and herbs. Make no mistake about it; herbs are pharmaceutical agents, just not recognized as such by our FDA. You need to have a pretty good knowledge of how they work, because they can have powerful effects in the body. It’s something that you learn as you go because there is so much to know. I do incorporate it in a lot of cases where people are interested or if I think it may be the best possible treatment. Is being a vet profitable? Yeah, it is. We work very, very hard, but you don’t really have to worry about money. We’re such an underserved profession that there are not enough of us, according to all the studies done by the American Veterinary Medical Association. So we have a surplus of work. Have you ever had a dramatic rescue? Yeah, I have. I’ve had so many … what species do you want? I remember a goat that had this really complicated birth and there was a baby stuck in her birth canal, and basically the head was just too big to fit through and we thought there was going to be one big baby in there. Because usually it’s a couple of small kids or one large kid. I gently pulled it out, and I stuck my hand back in there and realized that there was another baby in there. So I worked as fast as I could, and I pulled the second baby out and then put in my hand and there was a third one! The worst thing is that those kids are in there breathing birth fluid into their lungs and they can easily suffocate. So I run back to my truck, covered in birth fluid so everything is all slippery, and I have to grab this special fluid that helps them to breathe, and I squirt it under their tongues and they take a gigantic breath. And then I’m compressing their little chests and I actually got them to start breathing again. The first one died, but the other two survived. Do most ranchers get involved in birth or let nature take its course? Most commercial ranchers have a lot of experience handling birthing issues. But they will call us if it’s the worst of the worst. I’ve done Cesarean sections on the tailgate of my truck, in the dark, in the rain. I would say 90% of births ranchers handle on their own, but with those last 10% they call us and they’re usually pretty big emergencies. When is a vet usually present during the animal life cycle? For the operations that choose to use a vet for the birthing cycle, who use a vet to tell them whether the animals are pregnant or not, usually you’re there one to two times a year for that; and with the kids, generally I see a young, growing animal just once, like to give them vaccinations or do a health check. But that is just on an as-needed basis. It’s more about working with the adult animals to make sure they’re pregnant, making sure their vaccinations are up to date. Are there certain animals with which you feel an especially strong connection? I have a real soft spot for goats. They make you feel happy to be alive. I can eat a sandwich while doing the grossest thing. The only thing that might gross me out would be a smell. There are some smells, usually in birth. Like if a baby was dead and rotten in the mother, and I think there’s been maybe one time when I started to gag a little bit. For the most part, I’m totally immune to it. Most of the time, I’m really concentrating on saving the animal’s life so I’m not thinking about being covered in something. When I go to the store and I’m covered in blood and poop, I wonder what people think. To me it’s just a normal thing. It’s all in a day’s work. (1) A syndrome that can cause fever, diarrhea, and even abortion in mares. (2) Commonly called Foothill Abortion, it is transmitted by ticks and only affects heifers in their first pregnancy. (3) A bacterium that causes abscesses in horses. (4) Determine the shape and size by hand.